So you’ve been reading my blog and you decided to get outdoors AND help others…in a Third World Country. Or you are going to go on a long vacation backpacking through Africa, South America or Asia or even a remote part of the U.S. Congratulations, and have I got a book recommendation for you! I”m a big fan of Survivorman and some of the other survivor type shows (Out of the Wild, the Alaska Experiment; Man, Woman Wild and Dual Survival) are all interesting to watch and learn from. But personally, I am not anxious to brave the wild myself, make my own fire, eat dead squirrels I killed and skinned myself or sleep in freezing temperatures with only pine needles and a reflective blanket to keep me warm. I say that now, but what if I went hiking and got lost deep in the woods or in a seeming tropical paradise? I’d like to know how to survive then! Where can one go to find out how to survive a medical emergency or issue in any of the above conditions? While checking out some of the referring links to my blog I found a few survivalist sites and from there found an interesting books and classes to help you prepare for a trip to a less developed area of the world–or prepare for an emergency in the U.S. like a flood or other natural or even man-made disaster. The first is a book, Where There Is No Doctor: A Village Health Care Handbook . It’s presented as a public health primer for people living in Third World countries, small isolated villages, etc. that lack basic medical care. It’s a paperback and costs about $12.00 on Amazon. it contains info on practical, easily understood information on how to diagnose, treat, and prevent common diseases. Special attention is focused on nutrition, infection and disease prevention, and diagnostic techniques as primary ways to prevent and treat health problems. This 2007 reprint includes new material on preventing the transmission of blood-borne diseases, how HIV/AIDS is reflected in many health issues, and basic Antiretroviral treatment information, as well as updated information on children and aspirin, stomach ulcers, hepatitis, and malaria treatments. 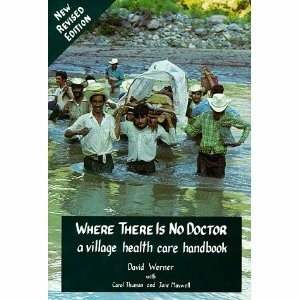 Click here: Where There Is No Doctor: A Village Health Care Handbook to order. Tuition is $345 for a three-day class. Lodging and food not included. Classes are held at the Ohio State University Extension Campus, 16714 State Route 215, Caldwell, OH 43724. Find registration information here. Thanks for commenting! I am not a doctor so I can’t give you medical advice about potassium iodine tablets. From what I’ve read on the internet (meaning, basically the same things you are reading), it sounds like these tablets only protect people’s thyroid glands. In Illinois, we’ve been recently cautioned against using them. Personally, I would not take any drugs that may effect my thyroid glands without consulting my medical doctor. Call your doctor and see what he/she advises! That’s what they are there for. To give you medical care and advice. The internet can only take us so far.